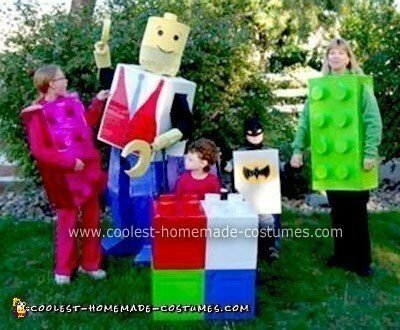 We needed to come up with an idea for family Halloween costumes that were “disability friendly”…so our Homemade Lego Family Halloween Costume idea was born! But not just plain Lego’s, some of our Lego’s have a little flair to them. Our daughter’s stroller is a bunch of Lego’s together, using all of our colors. Our son is Lego Batman, in honor of the DS game. Dad is a Lego Guy, the one responsible for putting us all together, so to speak! These costumes were made entirely from scratch over a period of several weeks, and are simply cardboard, wrapping paper, spray adhesive, construction paper, a couple of coat hangers, hot glue, a little bit of material, tape, and Velcro. Is there a site that you have put directions on how to make your awesome costumes ?? My little man would love the Batman one ! !